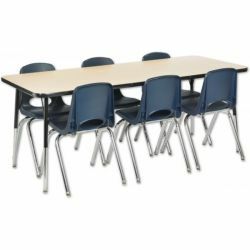 Rectangular Adjustable Activity Table and School Stack Chair set is perfect for the classroom, home or office! The 30" x 72" table top features a double-sided easy to clean laminate with rounded edges for safety. Three leg types are offered, each adjustable in 1" increments: toddler, chunky, or standard. This set includes six 18" stack chairs built for comfort and durability. Chairs feature a molded seat with vented back for comfort, reinforced ribbing in back and under the seat for added strength, and steel lower back support.